Backlink Diver uses proxy servers only for checking the pages with your links for Google PageRank and index. It does not use proxy servers to search the pages for your backlinks. You'll get numerous pages with proxy lists. Enter 210.212.152.4:80 in Google and click Search. You'll get even more pages with proxy servers lists. Before you can use proxy servers in Backlink Diver, you need to test if the proxy servers are working, anonymous and can be used to check the pages with your links for Google PageRank and Index. You'll need environment scripts to check proxy servers for anonymity. 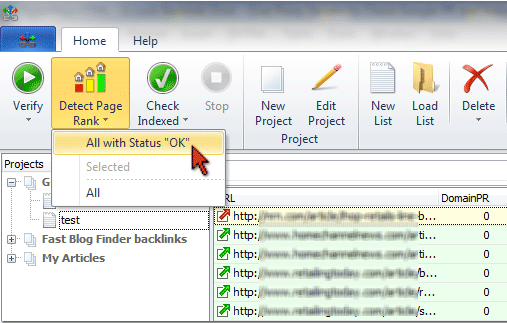 Click on "Proxy Manager" button on the Backlink per toolbar. Click on "New List" button in the Proxy Manager. A new list will be created under Proxy Lists at the left pane. To rename the list, click the right mouse button on the list name and select "Rename List" from the menu. Type a new list name. Now you can load proxy servers into the list. Copy proxy servers from a web page. 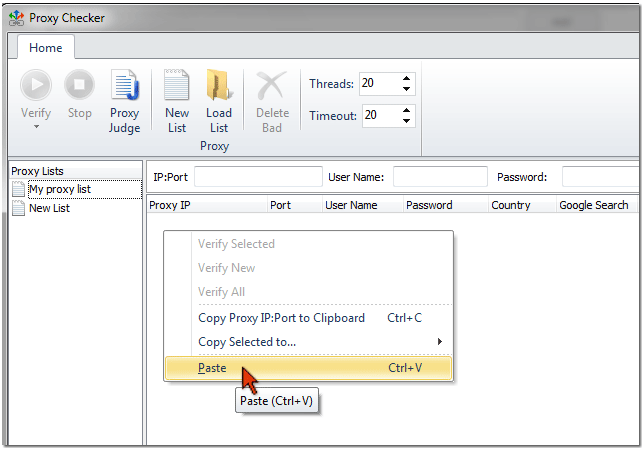 Click the right mouse button at the right panel in the Proxy Manager. If you have proxy servers saved in a text file, use the "Load List" option on the Proxy Manager toolbar. Type the proxy server IP and port number [IP:Port] and click "Add". If the proxy server requires the username and password, provide the username and password too. After you loaded proxy servers into the list, you can verify them for anonymity and for possibility to use for checking Google PageRank and index. 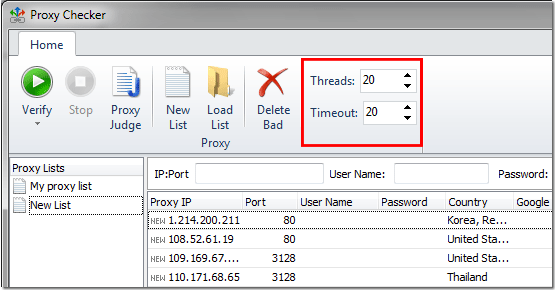 Before you start verifying proxy servers, adjust the Threads and Timeout on the Proxy Manager toolbar. It' s recommended that you enter as many Threads as many environment scripts you use. For example, if you have 20 environment scripts, set 20 Threads in the Proxy Manager. You can leave the Timeout by default. Select All from the "Verify" button menu to check all proxy servers on the list. To delete bad proxy servers from the list, click on "Delete Bad" button on the toolbar. By default the program uses only good proxy servers to check the pages for Google PageRank and index. If you have bad proxies on the list, you can re-check your list later and there is chance that some of bad proxies will be good. To check the pages for Google PageRank, Backlink Diver will use proxy servers with YES in the Google PR column. To check the pages for Google index, Backlink Diver will use proxy servers with YES in the Google Search column. 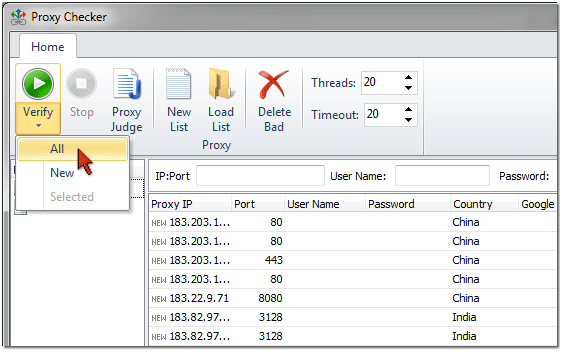 To save the proxy servers list and exit the Proxy Manager, click on X at the top right corner of the window. Now you can use good proxy servers to check the pages with your backlinks for Google PageRank and index. Click on "Proxy List" under the Home menu. Select the proxy list name you want to use. All with Status OK – checks the PageRank of all the pages with the Status OK where your backlink is found. Selected – checks the PageRank of the selected pages only. All – checks the PageRank of all pages on the list. To check the pages for the Google index, click on "Check Indexed" and select All with Status OK, Selected or All. We recommend that you test your proxy servers each time before you use them to check the pages for Google PageRank and index. Public proxy servers are not reliable and may stop working suddenly.